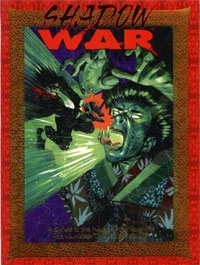 Shadow War is a guide to warfare, both formal and otherwise, among the Kuei-jin. From the honorable strife of the twilight war to the relentless savagery of midnight was against the Yama King's servants, from the battles outside the Middle Kingdom to the means the youngest Wan Kuei use in their struggles against their elders, everything a Kuei-jin needs to know about taking the field of battle is here. Wars of the Kuei-jin against their elders, the secrets of manipulating Scarlet Screens and more!